1. Cut out each element from your free reindeer template. Pin your pieces to your chosen coloured Dovecraft felt and cut around it. We’ve used brown, cream, black and red felt. 2. Using Fabric Glue, begin to glue each section to your jumper, ensuring the design is glued to the front of your jumper, in the centre. 3. When gluing down each section of your reindeer face, make sure to over lap the sections to create a professional finish. 4. Begin to add the felt features to the reindeers’ face. Before gluing it down, ensure you’re happy with the placement of your design. 5. Finish the felt design by adding the antlers; make sure to glue each antler at an angle. Leave to dry over night. 6. Check the reindeer design is secure and begin to sew the Dovecraft Christmas Basics Jingle bells on the antlers. TIP: You will need to loop through your thread a couple of times per bell to secure it on your design. 7. Add the finishing touch by adding a small line of Dovecraft red glitter glue to the reindeer’s nose to add a little shimmer! Now your Christmas Jumper is ready to wear! Your family will be able to see you (and hear you) from a mile away with this joyful and jingling design! 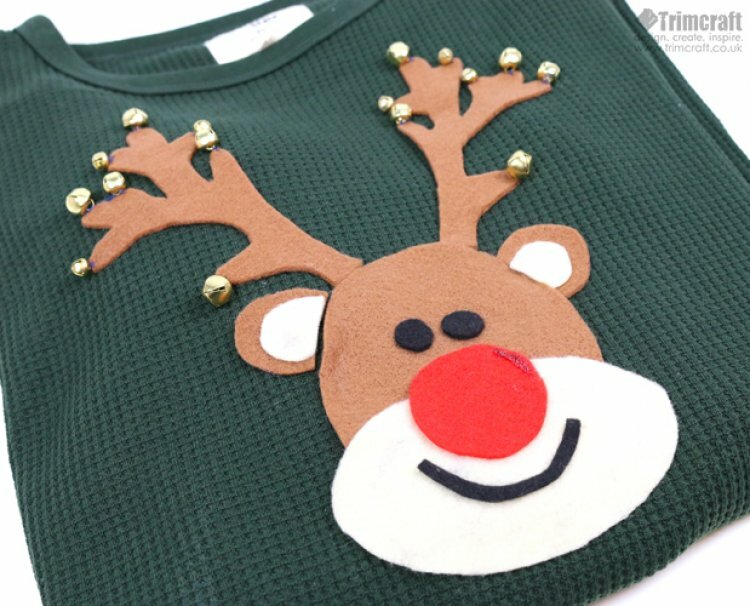 How will you use our free Christmas jumper reindeer template? We would love to see your DIY Christmas jumpers so remember to upload them to the project gallery and to #trimcraft when uploading to social media. This jumper will not be able to be cleaned in a washing machine but can be carefully washed by hand.